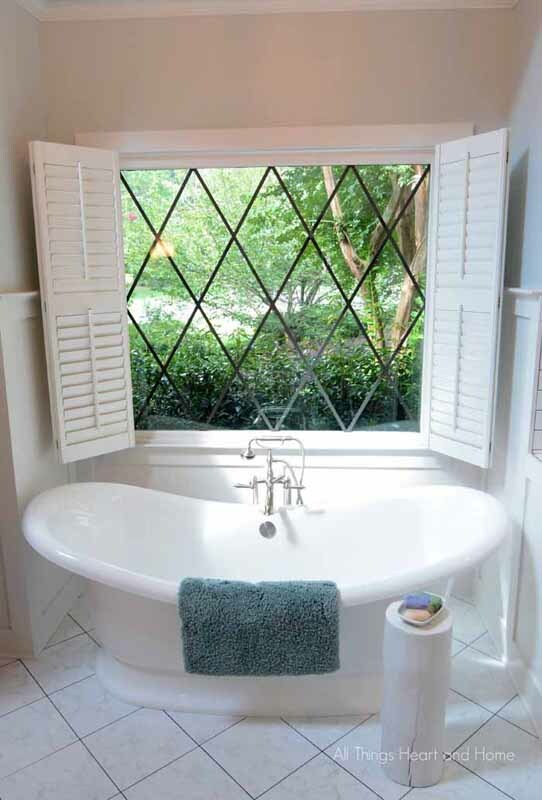 In my Master Bath Reveal post, I promised I’d give you the sources for all the elements we put in the space. I’m going to do that today, along with giving you our tips and tricks on where to save and where to splurge in a bathroom remodel! Oh, and by the way, what is a WOW factor for me might not be the same for you! 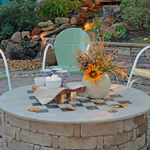 Finding your WOW factor is part of the planning and design process. And balancing the budget between function and fun might take some time. BUT, the good news is that we were able to off set some of the costs! So let me tell you how we saved! 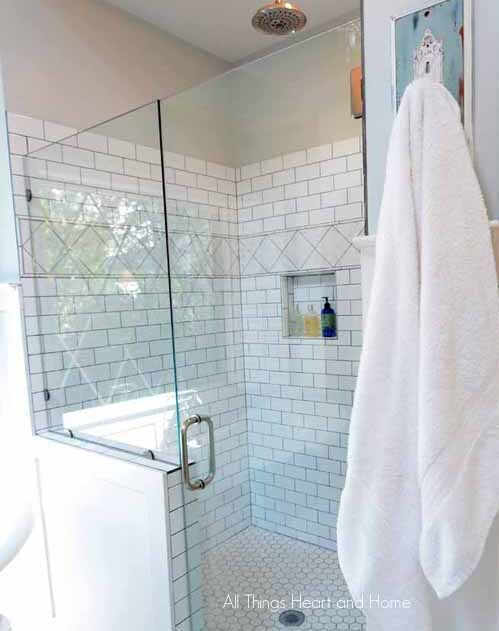 Tiles: We picked inexpensive ceramic subway tiles (as opposed to the marble subway tiles I originally planned to use) for the shower. 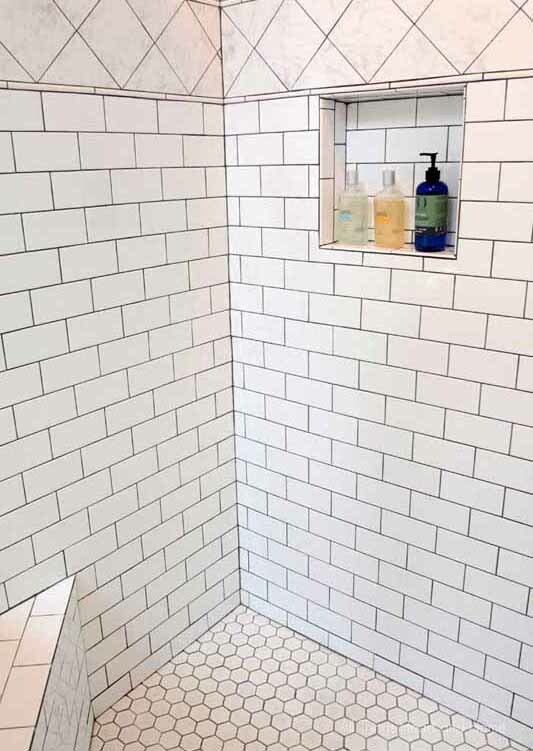 We used ceramic, marble-look tiles for the floor and the shower tile inset (as opposed to the Carrera Marble tiles I originally planned to use). I was worried about not using marble BUT, let me tell you honestly…I LOVE this floor! The dark grout and the nonporous, easy to maintain ceramic meets all my expectations! And by using the ceramic tile we cut our tile bill almost in half! 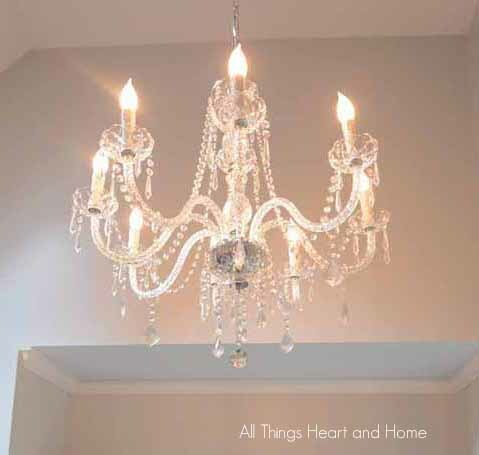 And low and behold: Crystal Chandelier Lighting 28ht X 28wd 8 Lights Fixture Pendant Ceiling Lamp was$129.00!!! 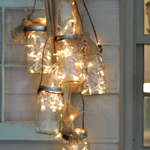 There are 2 catches to this super inexpensive chandelier: 1-it’s not crystal. All of these beautiful prisms are glass… Well. Who. Cares. (I’m sure someone cares, but not me.) And 2- the chain that came with the light was WAY too short. After going to a couple of lighting stores we ended up at Ace Hardware. 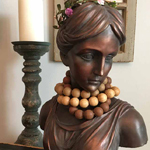 They sell LOADS of different style chain and we found an exact match! It’s cute and there was no reason not to use it! 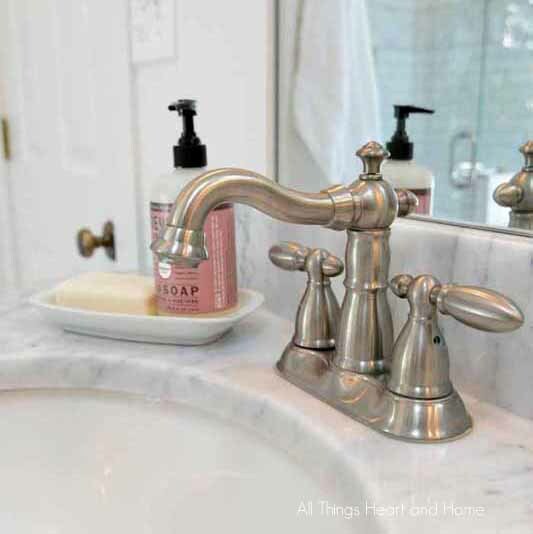 This was a tough call, while we loved the style of the faucets (and they were in great shape), keeping them meant we had to use brushed nickel finishes on the sconces and on the shower faucets…in the end, the ones I picked out to buy were $180.00 a piece and saving $360.00 by using the old faucets was well worth it! 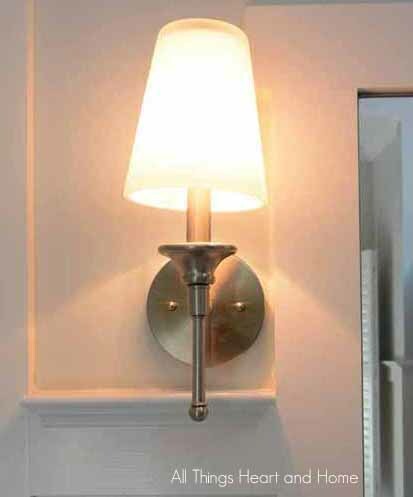 The Sconces : At first, I ordered 3 kind of expensive sconces. When they came they were too big and didn’t really give me the thrill they should have for the money. On a whim I ordered these from The Home Depot and are you ready? They were 29.99 each!!!! I saved over $300.00 from my original order! We had the cabinets custom made and the cabinet maker asked me to pick a stain. I knew I wanted a gray with a touch of brown. 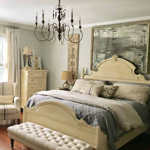 I bought 6 different stains and found one, Weathered Gray that I really liked. I asked him (the cabinet maker) to use the weathered gray but to add a touch of brown. Ya know, men don’t like measurements like ‘a touch’ ! He wouldn’t stain the cabinets until I saw a sample and okayed it 🙂 It was perfect. He said he added just a shot glass of brown stain to the quart of weathered gray. So that’s it! The contractor did the rest of the work and it was included in the bottom line. I’d tell you how much, but I think it would be different according to where you’re located! 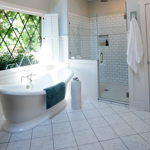 Robin, Your bathroom came out just Beautiful!!! 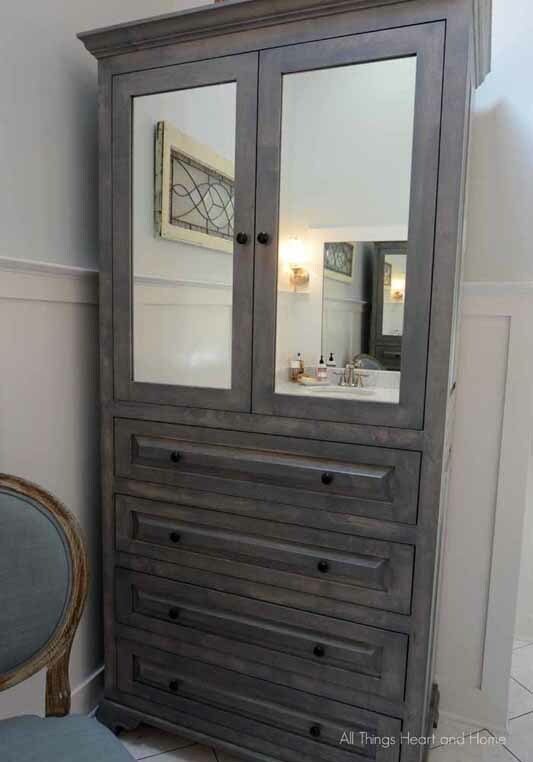 Love the cabinet and your color choice the weathered greay is one of my favorites too…didn’t think of adding brown to it …nice touch! It is all very lovely. The chandelier is really wow! The tile looks great. 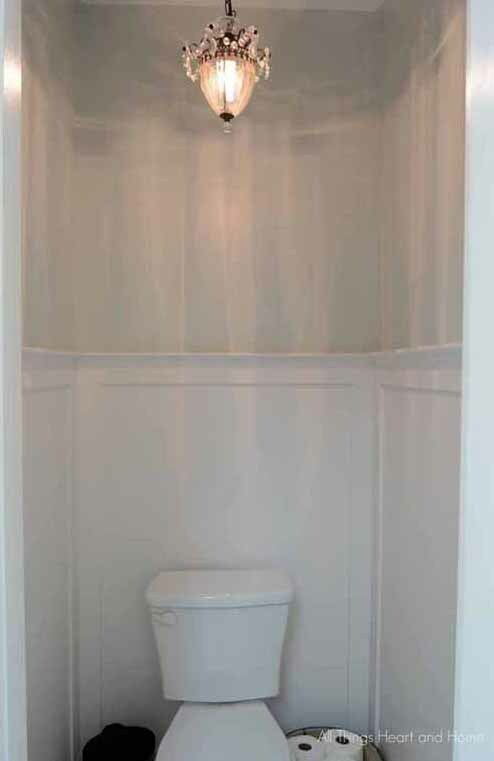 I love your tub with a window and the stain is perfect! LOVE IT! The detailed blog is so complete and informative. Your remodel is just gorgeous. Definitely will be pinning this for updating ideas to our 10 yr old bath. 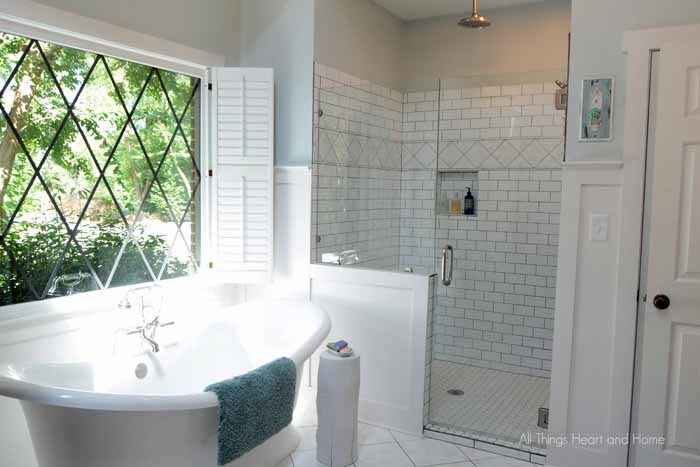 I especially love the tub! 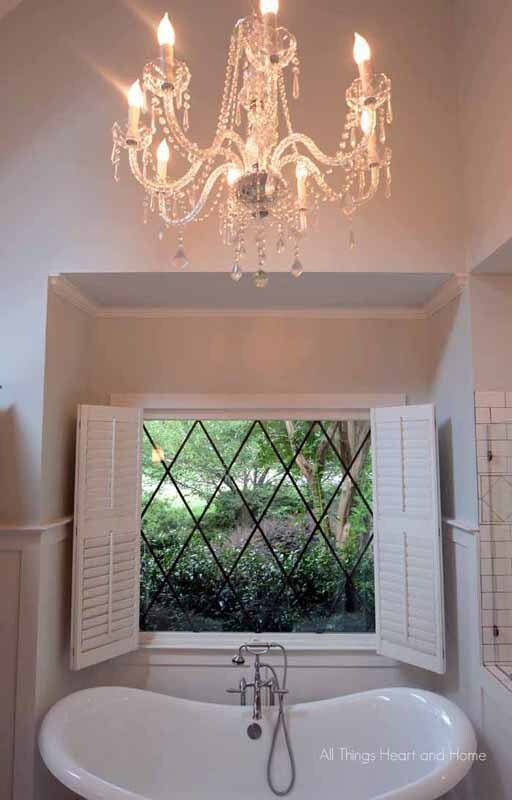 Your bathroom is just beautiful! I love all your choices, especially that grey/brown stain. 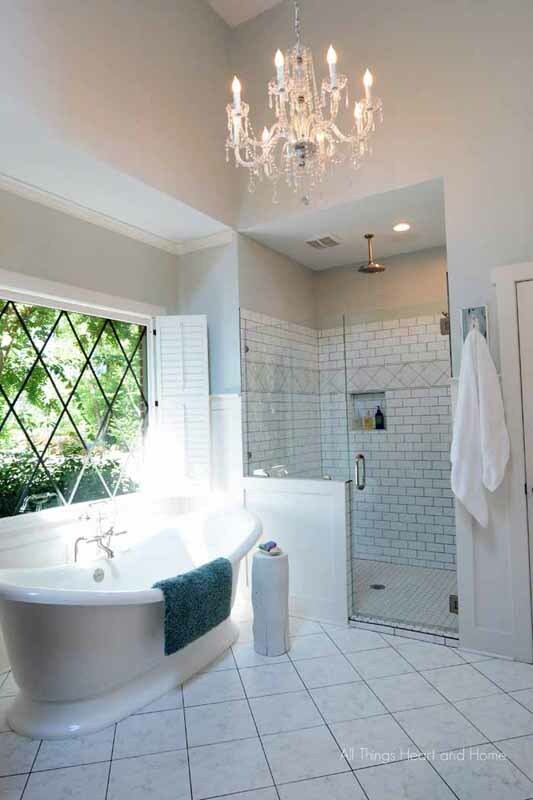 What a gorgeous bathroom! Love all you chose particularly the color of the cabinets. 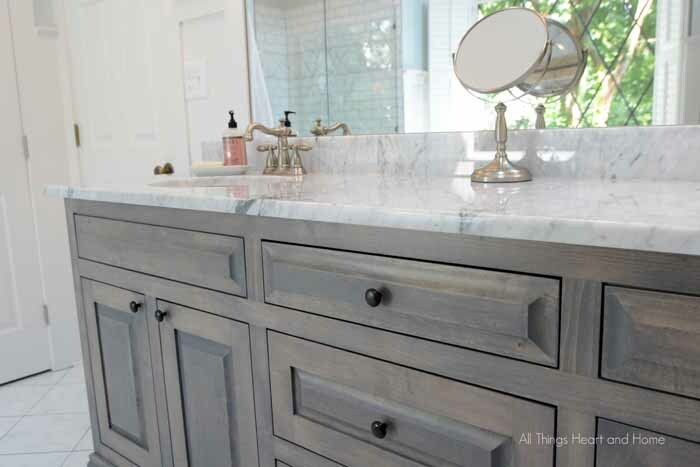 Can I ask your opinion about kitchen/ bath hardware? It seems every 5-10 years the color changes. We started with all brass in the late 90’s and have been switching to bronze in the last several years. But I see so much sliver, chrome, stainless now. Things go in and out of style. But it seems if you wait long enough your color comes back in style. I think find what you like and just stay with it. 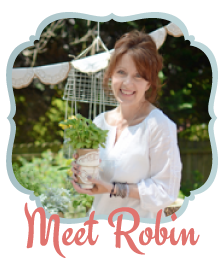 What do you think Robin?